Hannah Templer is a queer cartoonist and graphic designer currently living in Seattle. She graduated from Cornish College of the Arts in 2011 and has since worked as a colorist, cover artist and interior artist on well-known titles such as Samurai Jack, Tomb Raider, and Jem and the Holograms. She has also worked for several years at various Seattle design agencies, most recently as a UX designer at States of Matter. She enjoys life with her trusty dog Thistle and grumpy cat Noodle, and plays tabletop roleplaying games as often as she can. 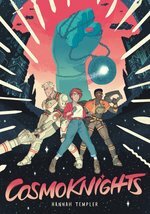 Read Cosmoknights as a free webcomic at www.cosmoknights.space, where the entire book will be serialized before publication as a graphic novel this fall!